A new IFAW report looking at the illegal ivory trade across Europe has found that the European Union is still a destination for illegal ivory, a major transit route between countries (especially between Africa and South-East Asia), and also a key exporter of antique ivory to South-East Asian markets. The report highlights a case study of a manufacturing centre found in Germany, after a seizure of 625 kilograms of ivory was made by enforcement officers at an airport. The ivory was found in boxes destined for Vietnam and it had false paperwork that led officers back to another address in Germany, where officers found a further 570 kilograms of ivory at an ivory carving factory, as well as grinding and cutting machines. This showed for the first time that Europe is carving and manufacturing ivory to be exported to South East Asia. Looking at the report as a whole, we can see that the research shows that significant ivory seizures are still being made across the EU and that a number of member states are important transit routes for the international trade. 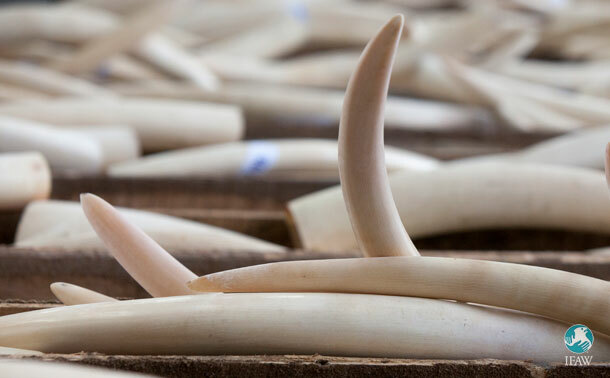 The false certification in a number of the examples also highlights organised criminal activity and smuggling from Europe to South-East Asian markets, which shows that Europe is still playing a role in the illegal ivory trade. As we all know, trying to measure any illegal market is almost impossible and when looking at ivory seizure data we have to acknowledge this is probably just the tip of the iceberg and that much more ivory is being transited through Europe than has been publicly reported. The new IFAW report provides a snapshot of the current situation within Europe. It is clear from the evidence collected that a number of European countries do contribute significantly to the illegal ivory market, directly or indirectly. When enforcement agencies have co-ordinated operations, the results have been impactful, and this is a real testament to the expertise and knowledge of the agencies involved. Some European countries showed no seizures of ivory or staggeringly small numbers of ivory seizures. It’s hard to determine whether this is because there were simply no ivory seizures made in those countries, or whether it’s a sign that wildlife enforcement is not a priority. The findings of the report also note there is potential for the European legal antique ivory trade to contribute to demand in Asia. Supplying antique ivory to these high demand countries could be helping ensure that demand for ivory remains high, and unwittingly provides cover for new recently poached ivory to be brought in to these markets. This suggests that the legal ivory trade does play a role in supporting the modern poaching of African elephants and the two cannot be separated. The big question has always been is Europe contributing to the poaching of elephants in Africa? We regularly hear this from politicians and antiques dealers, along with the claim that selling antique ivory is not to blame for the demise of elephants in today’s world. Claims that the EU has a very minor role in all of this are often held up. This report has made inroads into disputing these claims, by illustrating that seizures in domestic markets, processing plants and transit routes all exist within Europe. It’s clear that Europe does play a role in the illegal ivory chain and clearly a total ivory ban across the whole of Europe now needs to be considered urgently if we are close these markets and save elephants in the wild. You can take action today – please sign our petition, calling on the EU to end its ivory trade.